The second day of our trip to the Faroe Islands was quite productive. After photographing Gudrun in the morning, I had arranged to go hiking with Pól. I had been emailing with Pol back and forth for several weeks prior to our arrival so I was quite excited to finally meet him in Person. I had let him know that I was "moderately fit", my way of saying please don't set a course where I will give myself a heart attack, though I think the Faroese have a higher bar of fitness than I do. Joining us on our little romp through the countryside was Meinhard, Pol's good friend. So there we were, Pól, Meinhard, Peter, Adrian, and myself ready to tackle the route before us, 8.7 kilometres covering 500 meters of elevation. We were hiking Norðradalur, the area we had previously visited with Henrik but this time we would be approaching it fro the opposite direction, coming over and down from the mountains rather than from the sea. Our unhurried pace gave me ample opportunity to ask Pol & Meinhard questions and get to know them. Like the fact that they were both born in 1957 and grew up 50 metres from each other in the town of Klaksvík which Pól still calls home to this day. Meinhard works for the Faroese energy directorate and Pól works as a sales manager for a security solutions firm. Between the two of them, Pól is the more avid hiker. His most recent accomplishments include visiting all the peaks of the mountains Suðuroy in a weekend, running the west coast of Demark from the German border to Skagen in 6 days. It's safe to say Pól found this hike to be extremely easyl as we were huffing and puffing, lagging behind, calling for breaks to admire the view (when all we needed was to just catch our breath) he was sauntering casually up the mountain, arms crossed, and occasionally taking a phone call. Both of them love to ski during the winter, fish, herd sheep, do gymnastics and spend time with their grand kids. 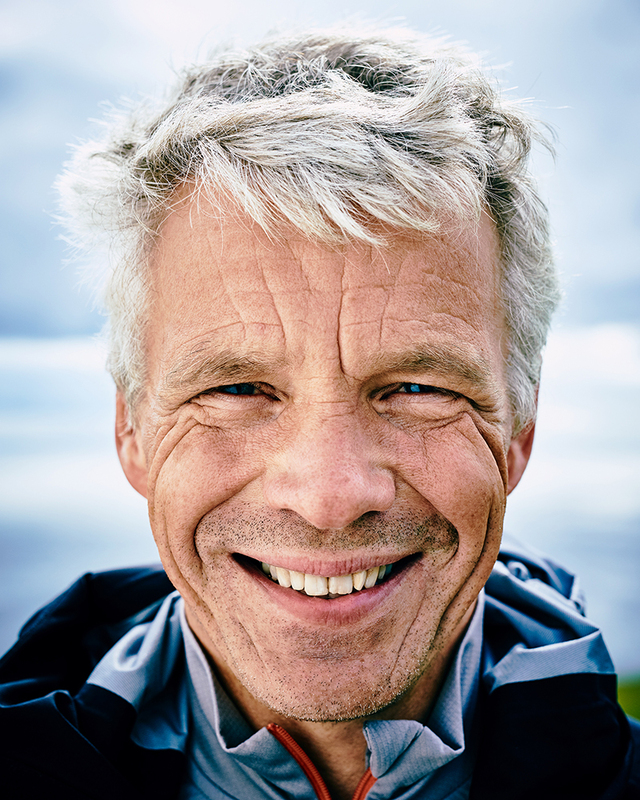 Meinhard told us about a local tradition of climbing the highest peak of the Faroe Islands, Slættaratindur, during the summer solstice. A more recent amendment to the tradition is the hotdog and beer cart that awaits those who reach the summit. Sadly there were hotdogs or cold beers awaiting us at our destination, but we were treated to some spectacular views of the islands. Meinhard pointed out Trøllkonufingur (Witch's Finger) which is a free standing rock face, that was first successfully climbed in 2012; and more recently in August of 2016. A team from New Zealand was able to climb it via the north face approach, which had never been done before, an effort which took 5 days. We encountered more sheep grazing than we did other hikers, they looked on curiously but otherwise ignored our presence Towards the end of our hike we met up with a few fellow hikers. I was surprised to see young toddlers scampering on the trails alongside us but apparently going hiking in the countryside is an activity the Faroese participate in even before they can walk! It made sense, with a backyard like this why wouldn't you get out there as often as you could?